Implementing Science-Based Resources: working with international and national researchers and institutions, the program is testing and introducing bio-fortified and improved varieties specifically bred to maximize nutritional content. A healthy start in life begins with healthy food, but not every child gets the nutrients they need for their brains and bodies to fully develop. When they don’t, the damage can be irreversible. 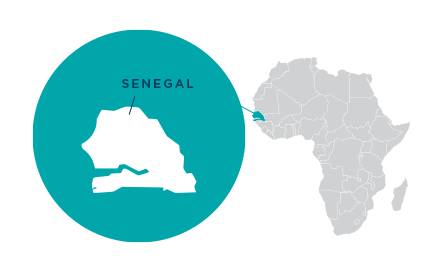 For decades, children in the village of Sylla Diongto in northeastern Senegal have been smaller than they should be. 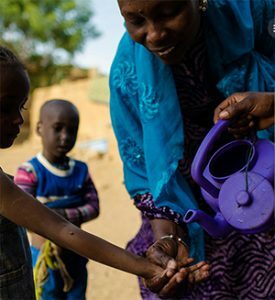 Hapsatou Kah teaches children to wash their hands before eating. When Yaajeende came to Sylla Diongto in 2012, they asked the community to nominate a leader – someone who could show them how to plant healthier and more diverse vegetables, share recipes for new nutritious meals and teach good hygiene skills, all with the goal of keeping children healthy. The villagers put their faith in Hapsatou. “I wanted to help my community because it faced many difficulties. Despite the fact that we did a lot of farming, it didn’t have much impact on the children’s health. They were always weaker than they should be,” said Hapsatou. Empowered with training and support from the Yaajeende program, Hapsatou plays many roles – teacher, adviser, role model and entrepreneur – to put her community on a path to better health. She is a farmer. She shows villagers new planting techniques, makes fertilizer and provides seeds for them to grow more nutritious food, such as sweet potatoes, which are rich in Vitamin A. She is also an entrepreneur. Sheprepares fortified flour and dried beans and meats, which she sells to her neighbors. As a community-based solution provider (CBSP) she has started her own successful business bringing nutritional products to her rural village, earning her over $45,000 USD a year. “I can make money with these activities, but that’s not what’s really important. 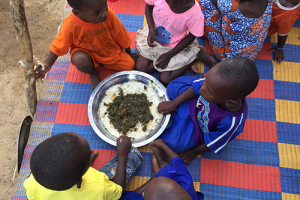 What the community gains from the work is much more important,” says Hapsatou. The Yaajeende program is begining a franchise component, called CultiVert, which would support CBSPs like Hapsatou to grow their businesses. “Our next generation will be in much better health because they will know better how they should eat. When you eat something that is clean, good and rich, you will have a good, healthy life,” said Hapsatou.